Earlier this year on our Medical Center Eye Clinic, Salem ophthalmologist Dr. Ryan Lapour wrote an excellent summary about glaucoma and what some of the risk factors are for this disease. In today’s post, I will discuss how we treat the disease at our eye center in Salem. While glaucoma is a complex disease with multiple risk factors, the only way we have to treat the disease is to lower a patient’s eye pressure. The goal of treatment may be to accomplish one of two things. First, to prevent glaucoma in people who have healthy optic nerves but elevated eye pressure. Or, second, the goal may be to lower the eye pressure to a level that prevents further loss of vision in someone who has experienced damage to the optic nerve and subsequent vision loss. The different ways we have available to lower the eye pressure constitute the different options we have for treating glaucoma. The primary treatment used is a group of medicines administered as eye drops. These include latanaprost, brimonidine, dorzolamide, and timolol. There are also combinations of these medicines that are available in single bottles to afford greater convenience when multiple medicines are required. Eye drops are almost always the first line of treatment. Every medicine has potential side effects and some medicines must be avoided in certain medical conditions. For example, timolol is a “beta blocker” and should not be used in people with asthma and other lung diseases. Laser treatment is a good option in people who need to have their eye pressure lowered further, even though they are on eye drops, and in people who wish to avoid drops. So-called “selective laser trabeculoplasty” is the standard of treatment in which low-power laser spots are applied to the fluid drainage structure within the eye. This lowers the eye pressure in the majority of patients. The advantage of this treatment is that it can be repeated; the disadvantage is that the beneficial effects can wear off in time. If you’re suffering from the early warning signs of glaucoma, our team at the Medical Eye Center can help. Our team of experience Salem ophthalmologists have the knowledge and skill to successfully treat your glaucoma. We understand that vision problems can cause a lot of stress and fear over the unknown. That’s why we always take a compassionate approach to patient care. 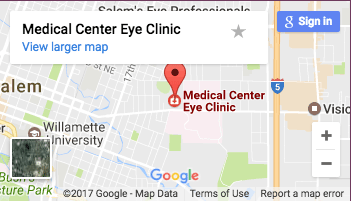 Call our office today to schedule your glaucoma consultation at our eye center in Salem.